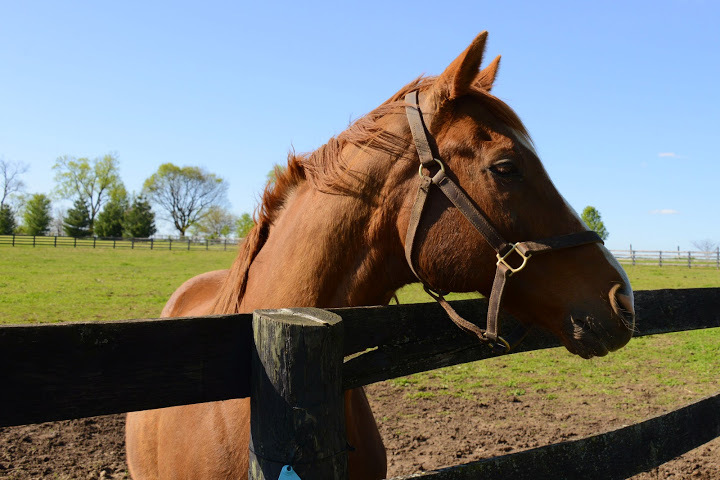 On a farm full of old horses, no news is often good news. I’m happy to report that in the past weeks there’s not that much news at Dream Chase farm. One horse does have an unfortunate news item to relate. Some days ago Futural had a paddock accident that injured his left eye. Our vets could not save the eye and it has been surgically removed. Futural is recovering well. His right eye is fine and he’s adjusting in stoic good spirits, eating well and enjoying the extra care he’s getting from Tim, Carole and the barn staff and the love and bananas–his favorite treat–he’s getting from the volunteers. Futural. I’ll post a more recent photo soon as I have one. He’s doing well. While in the hospital Futural got a visit from his special friend, Chris McCarron. The Hall of Fame jockey rode Futural to his victory in the 2001 Mervyn LeRoy (G2) and game seconds in the 2001 Californian (G2) and San Diego Handicap (G1). This wasn’t the first hard luck the two had shared. In July 2001 they finished a strong first in the Hollywood Gold Cup. It should have made Futural a Grade 1 winner and given one of the finest jockeys ever a win in that prestigious race. They were much the best, the inadvertent bump didn’t affect the outcome, and Mr. McCarron rode safely. Their disqualification remains puzzling to many. Admire Futural’s youthful athleticism in this G1 race for yourself. Be that as it may, Futural’s present fortitude has won our admiration all over again. 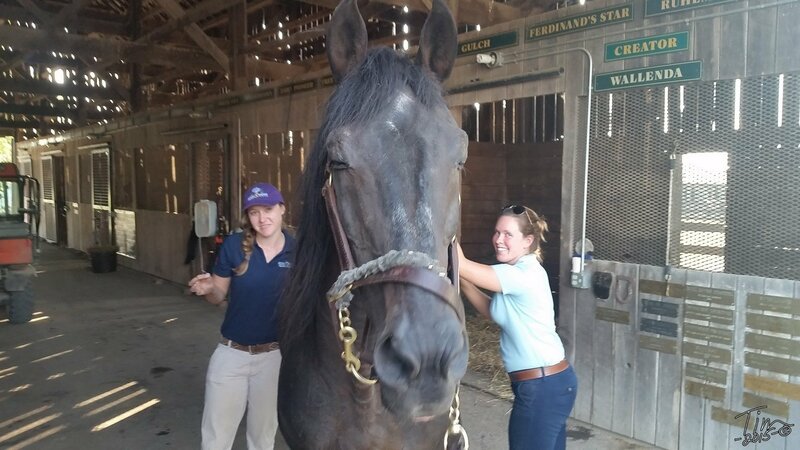 After his recovery on stall rest and turnout by himself in a small, safe space, Futural will again be available for visits. According to the plan Tim recently mentioned, he may get a paddock more on the main tour route than he’s had for some years. For Futural’s excellent medical care Old Friends’ grateful thanks go to our mainstay, Dr. Bryan Waldridge, and at Rood and Riddle, J. Brett Woodie, DVM, MS, Dipl. ACVS, and Elizabeth L. Anderson DVM. Did I say no other news? Maybe not news about the horses, but good things have been going on that make the horses’ days ever more fun and comfortable. For instance, our wonderful new auxiliary stalls and bathing station provide the “back 40,” with nearby in-stall care and exams and convenient facilities for the cooling baths so welcome during hot weather like we’re now having. 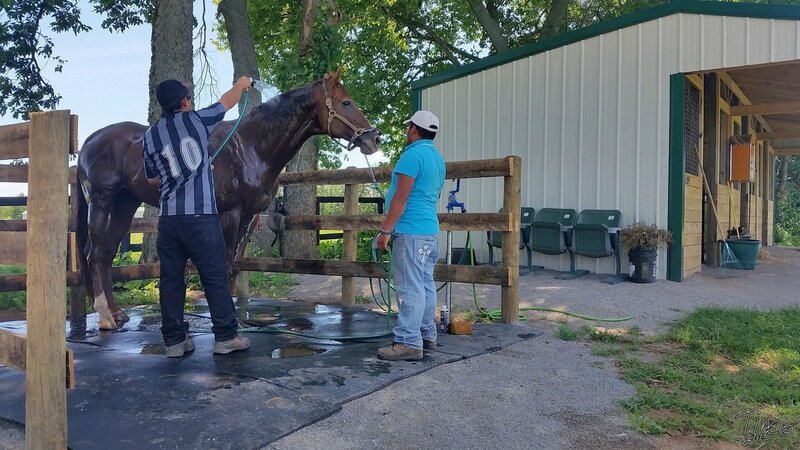 Tinners Way enjoys a bath from Antonio and Yoel at the new bathing station. Photo by Tim Wilson. By the way, items are still needed for some of the stalls you see in the background. To hear about those needs, please call the OF office, 502-863-1775. Another piece of good news that really matters to a few residents: the regular visits the farm has been getting from JJ Vautier Brown, DVM. Dr. Vautier is a specialist in acupuncture and massage. Hidden Lake is benefiting greatly from her acupuncture sessions. She’d built up soreness, and with each session her stride gets longer and more free. She’s running for the sheer fun of it again. Below is a session with Wallenda. 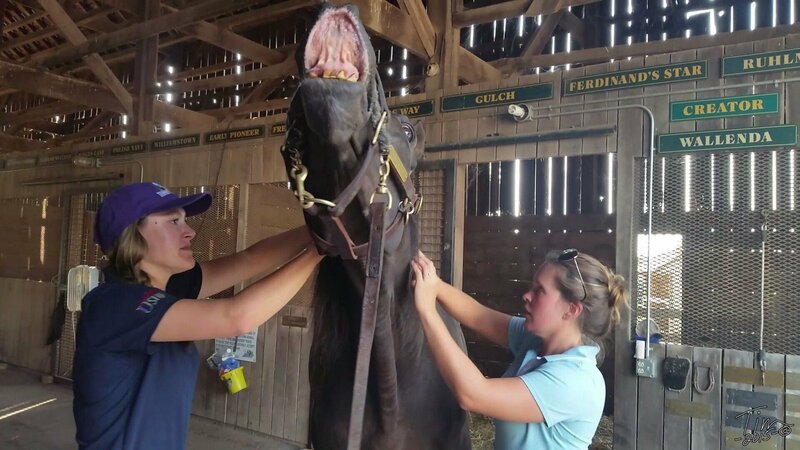 Dr. Vautier brought along Brittany Breidenbach, DVM, a colleague from Rood and Riddle Equine Hospital in Lexington. Doesn’t this make you want to retire to Old Friends? Wallenda: “Oooh, yes, that’s the spot! Right there!” Photos by Tim. Thank you to Dr. Vautier and her colleages! 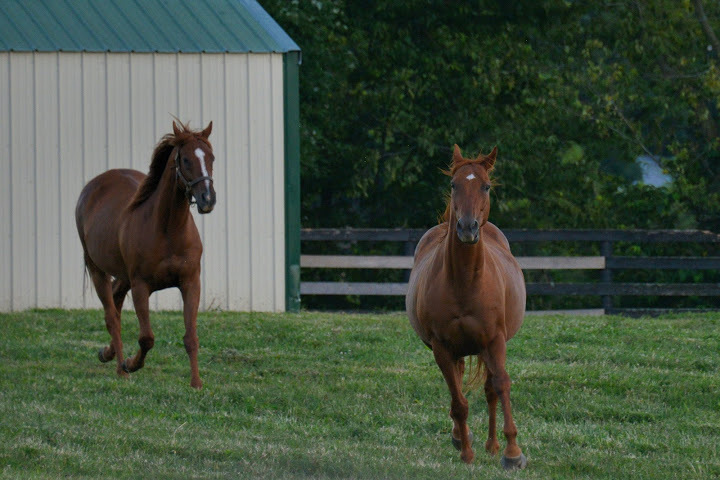 Meanwhile, as summer heads toward autumn, the horses enjoy the cooling breezes that come each evening. Sunset is playtime. Massone and Daytona. Photo by Laura.